Hi all! Firstly, thank you to everyone who’s made Literary Lushes such a success so far! I know we’ve had a few issues with the post office (*glares at PO*) but the ARC tours are so much fun and we have an absolute BLAST with the Twitter chats! Just wanted to make everyone aware of some changes that are going down as we speak! Firstly, we’re scrapping the Literary Lushes blog page. DON’T PANIC. We’ll still be around doing ARC Tours but under a different name — On the Same Page. 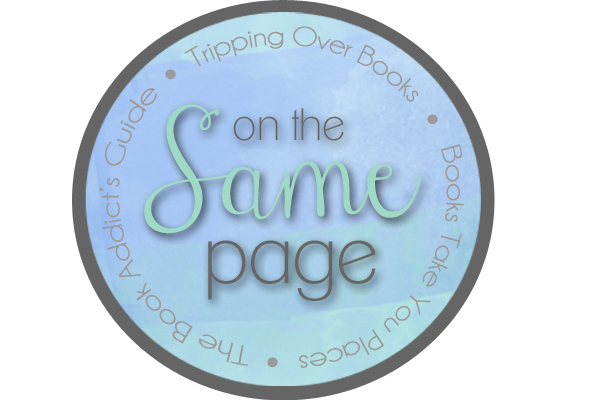 On the Same Page is a brand-new feature hosted by Alyssa from Books Take You Places, Amy from Tripping Over Books, and of course The Book Addict’s Guide! It started off Alyssa and Amy reading a few books together, then Alyssa and I reading a few books together and we decided to all get on the same page (ha, get it?) and read a book all three of us at the same time! We have a lot of similar tastes and at the same time, we also push each other to read outside of our typical genres. We decided to make it an official thing and thus, On the Same Page was born! So what do we do? Besides reading a book together, we’re bringing you different aspects about the book that we feel are important. Whether we were inspired to create a playlist, digging a little deeper into the history of that particular setting, or pulling our favorite quotes, each of us will be bringing a different side of the book to share! We’re also doing a bit of a merge between Literary Lushes and On the Same Page! We have a blast with the Twitter chats, so don’t worry, they aren’t going anywhere, but we WILL have Amy joining us as another chat host! So what happened to the ARC tours? Well they’ll still be around too, but the amount of ARCs that we have available at the moment has drastically decreased. We were using a lot of our personal copies from BEA and we’ve run out of BEA books! We still have the occasional fabulous ARC and some awesome donations, but until BEA rolls around again, we’ll probably be hosting tours less frequently. The biggest change for Literary Lushes will be the website and the Twitter account. We’re scrapping the site, updating the Twitter handle for On the Same Page, and moving all ARC tour sign-ups to our On the Same Page blog pages or directly through Twitter! You can check our pages any time for ARC tour info and Twitter chat updates! We’ll still be using the #LitLush hashtag for the chats (because we kind of love it) but we’ll be hosting either from our blog’s Twitter account or from the newly re-named On the Same Page Twitter account (like we were doing with @LitLushes). Any ARC tours that we have will be announced with the Twitter account and sign ups will be located directly on our “On the Same Page” pages on our blogs instead of having a new blog post with announcements and sign-up posts. If you ever have any qiestions, please let us know and bear with us as we make this new and exciting change! We have a few posts up TODAY for our On the Same Page feature where we talk about Days of Blood and Starlight by Laini Taylor so don’t miss those! Please visit the On the Same Page tab on our blogs for any more info as well as ARC tours and upcoming Twitter chat topics! Looking forward to sharing this exciting new venture with you guys! This entry was posted in Info and tagged On the Same Page by litlushes. Bookmark the permalink.